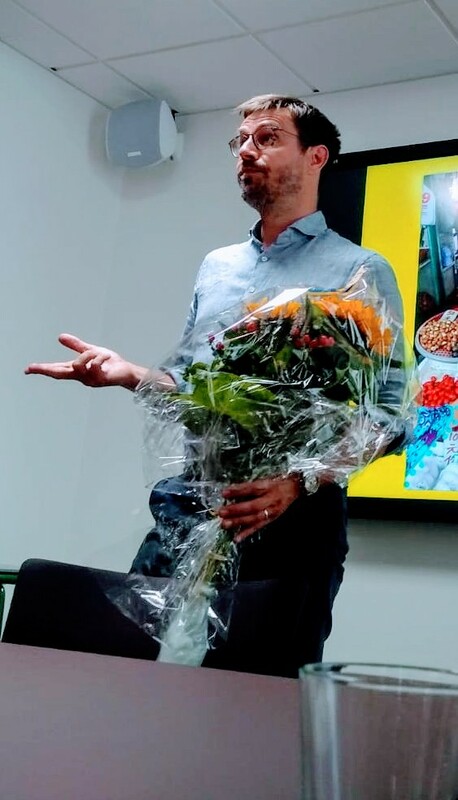 HKCCSE / South organized together with DISH – Global Centre for food Quality and Safety (hubs in Denmark, Italy, Sweden and Hong Kong) a seminar on gastronomy with master chef Robert Nilsson on July 30. Robert focused mainly on two areas: food in Hong Kong and the new Nordic Cuisine. The meeting took place at the Vinge Law Firm in Malmö. The seminar attracted – in spite of vacation time – a high enough number of attendants to fill a conference room. The guests constituted a good mix of representatives from global companies, SME:s, science parks, regional authorities and academia. Hong Kong is one of the main food hubs in the world. Food has a very high priority both among the citizens and the tourists, and with good reason. One explanation for the high gastronomic standard is that the city has a number of cultures within its borders. These cultures (Chinese, east Asian, Indian, British and American, to name a few) are all reflected in the different types of food offered. The exciting cross culture solutions that this diversity results in create a unique and global food centre. The cosmopolite and exquisite cuisine is a good example of how Hong Kong can offer so much more than just banking and finance. The other topic discussed during the seminar was the new Nordic Cuisine, a trending concept that is becoming world-famous. As one of the main initiators and protagonists of the New Nordic Cuisine Robert Nilsson provided interesting and valuable insights. The term “Nordic” easily brings the mind to design and innovation, two fields where the Nordic countries often have a leading position. The word is often associated with a modern, original and simple style, which in many ways aligns with the concept of the new Nordic Cuisine. It looks easy enough, but this approach is revolutionary in many parts of the world and offers a big challenge in global five star restaurants where imported lobsters and Wagyu beef on the menu have never been questioned. The new Nordic cuisine with its different values is already at the forefront when it comes to leading the way to necessary changes in agriculture, food production and habits. Since sustainability is an essential part of the process the concept has a positive effect on the environment and could help reduce climate change – a pressing matter as we all could feel when we went out of the conference room, the outdoor temperature being over 30 degrees. Promoting and investing in the New Nordic Cuisine could be seen as a way of strengthening the trademark of the Nordic countries since it reflects positive value to everything “Nordic”. This goes far beyond the bubble of gastronomy, all while making the world we live in a more sustainable place! Robert Nilsson from Ängelholm and Hong Kong is a world famous master chef who is now Director Culinary at the W Hotel in Hong Kong. His CV is very long and impressive and includes hotels and restaurants like Viceroy Palm Jumeirah in Dubai, Copenhague in Paris, Grand Hotel Mölle, and Operakällaren in Stockholm. He has also been master chef for Nobel dinners, and lectured at NASA, Houston, in cooperation with Lund University. PS. If you are in Stockholm and interested in Hong Kong gastronomy, check out the HKCCSE After Work event the 4th of September here.